In a not-too-distant future, the United States of America has collapsed, weakened by drought, fire, famine, and war, to be replaced by Panem, a country divided into the Capitol and 12 districts. Each year, two young representatives from each district are selected by lottery to participate in The Hunger Games. Part entertainment, part brutal intimidation of the subjugated districts, the televised games are broadcasted throughout Panem as the 24 participants are forced to eliminate their competitors, literally, with all citizens required to watch. When 16-year-old Katniss's young sister, Prim, is selected as the mining district's female representative, Katniss volunteers to take her place. She and her male counterpart, Peeta, the son of the town baker who seems to have all the fighting skills of a lump of bread dough, will be pitted against bigger, stronger representatives who have trained for this their whole lives. Collins's characters are completely realistic and sympathetic as they form alliances and friendships in the face of overwhelming odds; the plot is tense, dramatic, and engrossing. This book will definitely resonate with the generation raised on reality shows like 'Survivor' and 'American Gladiator. 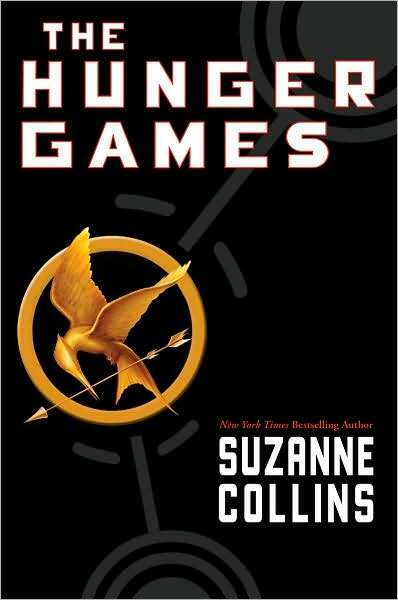 The Hunger Games was a fantastic and intense reading experience. I could not put this book down. It consumed me. Katniss, or Catnip as her best friend Storm prefers to call her, lives in Stollen - a part of District 12. We are in the future, and North America is made up of districts with Capitol holding the power. As punishment for earlier rebellions, there is the annual Hunger Games. Each district must send a girl and a boy to compete in the games. There is only one winner; the person who survies until the bitter end. The competitors are chosen via a lottery. The Hunger Games is shown on TV in every district. The idea for this book is not original, but is much similar to Battle Royale, which came out as a novel in 1999 and became a movie in 2000. In Battle Royale a class of 42 students are kidnapped and thrown into a deathgame where there can only be one winner. In the Hunger Games, the number of participants is 24, and also here the state have the power and there can only be one winner. Both the endings are also a bit a like. Some might say that the Hunger Games also resembles The Lord of the Flies. Suzanne Collins have created an exciting world I did not want to leave. I was hooked from the first page, and even had to sneak off to the toilet during a concert to find out what would happen next. The book kept me awake at night, and I was eager to reach the end and find out what would happen to Katniss and Peeta. Katniss is a great female heroine. She is not one-dimensional and clearly the author wants the reader to like her. When Katniss kills one of her opponents, it is shown as a last resort and I as a reader can understand why she had to do that. She is not, as opposed to other participants in the Hunger Games, a sadistic and violent person. She tries hard to remain sivilized. There is also a love triangle here, and we are never quite sure who feels what and why. The Hunger Games kept me at the edge of my seat. I loved this book, and have already started the next installment. If you have not read this book, do so today! My name is Valerio Oliveira, I am an IB studen,t and I am doing my Extended Essay about the film and the book: The Hunger Games. I am in my second year in Lillestrøm Videregående Skole. I'm actually looking for a person to talk with, someone who is specialized in the topic, and someone that could give me an opinion about the book and the movie. My main aim is to talk to someone, like a little interview, just to talk about the movie and the book. Can you help me with it? My main goal is to talk about their similarities and differences between the book and the movie.